Well, Labor Day Eve was rainy and cold. That didn’t bode well for fishing, but, the next day, I headed out to the Farmington. As I’ve written before, September for me is the toughest non-winter month. Fortunately, I early on landed two fish, both grizzled stockies, a good-sized rainbow and a Survivor Strain brown. Then, nothing. I tried all sorts of nymphs and streamers with all types of presentations. Nearly every other angler that I saw was fishing but not catching. I hit three spots in all. The fish were definitely there, but they weren’t taking what I was throwing. A beautiful day, though. It was nice to be out. The only angler who did well was a spin fisherman perched on a shoreline rock. No waders. And, he pulled out fish after fish. He was using an ultra-light and very short spin-casting outfit. He seemed to be using bait, for he put something on the hook after each take. He would cast out, drift something downstream and wait for a strike. No bobber. My guess is that he was “tightlining.” I’ve seen other anglers use this technique. They have fingers holding the mono line to sense a take. I’m guessing they add weight to the line. He wasn’t crawling something back to him. Whatever he was fishing was suspended in the water column or swinging slowly on the bottom. Anyone familiar with this technique? Are they using bait and swinging it on the bottom? Just found this video below. Meal worms, split shot, 2-lb. test fluorocarbon, fingers on the line to detect takes, and a very supple spinning rod. Tightlining v. 1.0? Before I started fly fishing in earnest, I learned how to trout fish by “tightlining” with bait. It was highly effective (as you stated), but part of the reason I switched to fly fishing was the tendency of fish to take baited hooks deep as I am a mostly catch and release type of person. Hey Ashu, thank you for the reply! I noticed the angler wasn’t retrieving at all. So, is the technique about swinging a heavily-weighted worm/grub and sensing a take with your fingers? I’m guessing you use a very short and light spinning rod to sense any delicate takes? More or less. It is a lot like tightline nymphing where you follow the line with the rod tip as it’s ticking along the bottom and sometimes letting it swing up. A lot of strikes are felt as a tap or seeing the line stop. A sensitive tip or having your finger on the line definitely helps with detecting strikes. I too have watched some very sophisticated bait fishermen work the water with effectiveness. I do know most of the fish they take are lip hooked so they must be able to sense the pickup immediately and set the hook. A lot use mealworms. Unfortunately there are a lot of other fishermen that got to save that $.03 hook and fish mortality follows. Of course some flyfishermen are in the same boat, but the tools we use seem to lend to less mortality when the fish is played properly and if we are willing to cut the line on a dicey hook placement. Steve, thank for the comment. Yes, this guy was able to quickly release fish. Fortunately, there was no gut-hooking, which is always tragic to see, at least, for me. Hope you’re well! 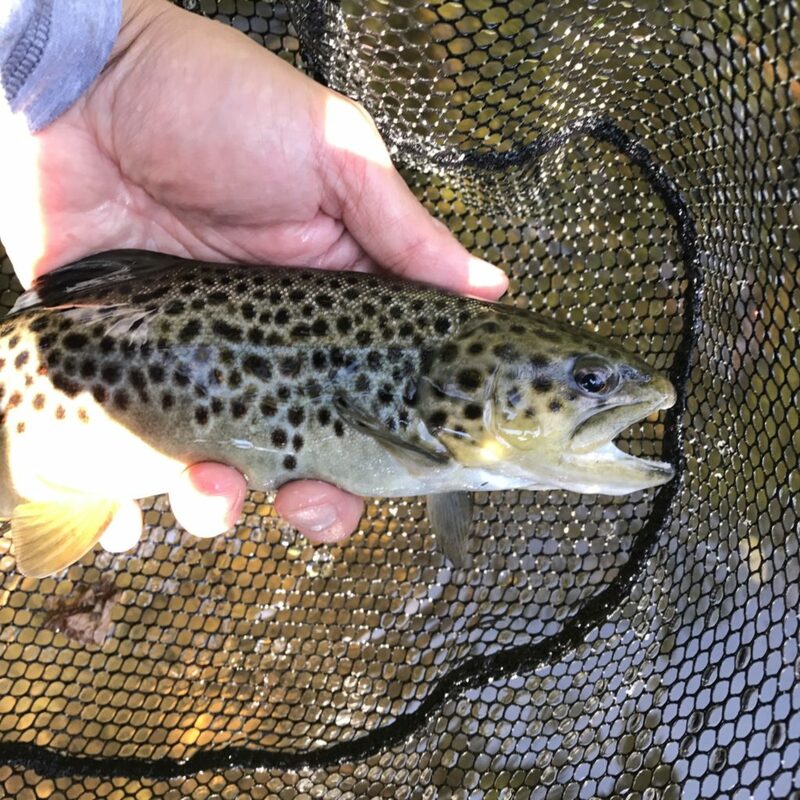 When I first started fishing for trout that’s the way I fished with a worm on a hook very rarely any weight and cashed up stream and let the current take it down and wait for the take on slower flows you would hold the mono in your fingers and after flows you could feel with your rod as the line got tighter faster. If you set the hook quickly you rarely gur hooked fish. Ah, makes sense! Thank you! If the guy you saw was a tall 30ish fellow with a go tee,he was fishing a homemade trout bait that he pinches on the hook after each take.No secret here except for his bait concoction that works extremely well on fresh stockies.You probably can find the recipe online.He molests more fish than you can imagine and ticks off alot of fly fisherman in the process.If you fish the Farmington often enough you’ll be the beneficary of some of the fish him and his buddy have scarred. I think that’s the guy! Yes, he was with a buddy. He was not fishing an area that was recently stocked, though, and so, I could be mistaken. I found some online recipes. Dough balls. Yuck. Not my style of fishing, catching dinks on bait. But, he was releasing lip-hooked fish quickly with forceps. I guess that’s the bright side. Great point about fish mortality. We all should be very mindful of that. My grandson is visiting me for several days. Wanted to take him trout fishing on the Farmington. Can anyone suggest an area on the the where we can spin cast from the shore line with some luck? Would appreciate. Before I became re-addicted to fly fishing I’d jig the farmington all the time. Small jigheads and plastic. That usually carried an average of 15-20 trout a trip. After years of doing it I got tired of it. Every once in a while if the fly fishing is being unforgiving I’ll go jig them. It is the best way to trick those wary browns when the water is considered unfishable via long rods. Interesting! Were you targeting the deep and slower areas of the river?